The practice is simple. Follow your breath. Again and again I have heard that life is a stream — the world that is true, all existence, and each sentient being is an ever-flowing stream. We are not the same from one day to the next, from one moment to the next. And I have known, for a long time, that my understanding of this truth is only, was only, an intellectual understanding. I knew I had not attained it, although I believed it, and my mind, my mind understood it. 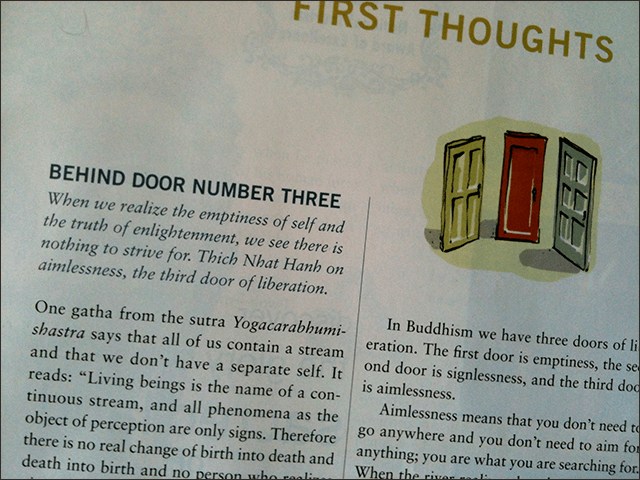 And then today, thanks to a little text in a magazine (shown above), it entered into me with enormous clarity. I understood it for the first time. It was crazy — I cannot explain exactly how it was different, but it was — so very, very different. And it lasted only moments. Some moments. I’m left with a kind of vestige of that realization. I am more than I was before, but I am not the same as I was in that moment. “… I shall liberate them all. And though I thus liberate countless beings, not a single being is liberated. I have meditated on this again and again, again and again. Today, for a moment, I attained it. I am a student of Zen.